Best Adult Runner up, Best in Show Emley 2018. Persues has gone to a new home with Marie & Clive who are hoping to start showing soon. Hopefully Persues will help them along the way. Centura along with his brother Proxima (Opal). Have been to a few shows as U/5 both doing well for them selves. Looking forward to taking them out as Adults soon. Centura has matured into a Handsome young man. 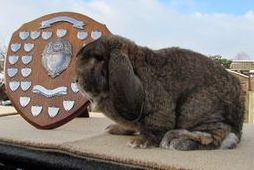 He was Best of Breed Midland Lop. 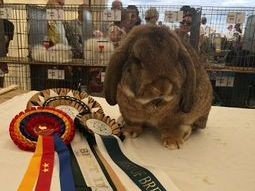 held at the All Lop Show Nov. 2017. Arnott did well for himself as an U/5. 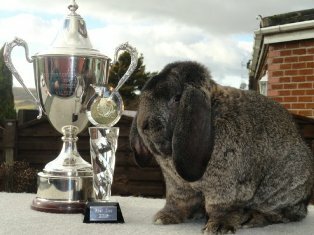 He went Best Lop @ Keightley Ag Show Runner up Best in Show Best French U/5 NFDLC West Midland Champs Show. He also managed quite a few Best U/5 Challenges up & down. Arnott has matured in to a lovely strong Adult.We have had him out & about early 2017. 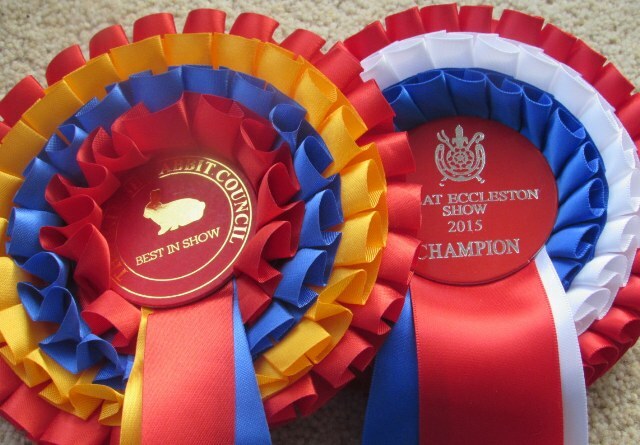 His best achievement to date,runner up Best in Show at East Lancs in April. He has enough coms to claim his Supreme Championship from the NFDLC. He is on his way to winning his Double. This young man was one of those babies that shone from the day he stepped out of the nest. "Look at me here I come" He has been well received on the Judging Table. It took him a while to come in to coat, but when he did it was worth the wait. He has an abundance of guard hairs.At present he is maturing into a Beautiful Adult. Well here we are it's April 2017 & we are still waiting for Perez to clear his coat. Perez decided he didn't want to be a show Rabbit his coat just wouldn't clear so he' s gone to live with Alma, He will enjoy his freedom with Alma. I am sure Almas Grandchildren will love him. He's a big baby. Lucian is bred from Maverick, We did this mating to get right back to Rossendale's lines. His Grandad is our very dear old friend Drummer Boy he was one of the 1st Ag we bred to do well for himself. His Gt Grandad is the memorable Butterfly Mistake. He is litter brother to our 2 lovely girls Rossendale' s Freya & Almera. We have mated him to an Agouti Doe so hopefully there will be something very nice in there. Lucian has sired a lovely litter mated to Rossendale's Thyme. 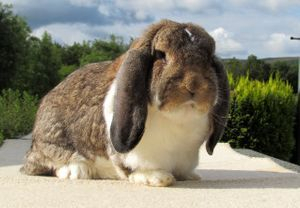 Rossendale's Samson is from this litter. A Doe from this litter has gone to live with our 2 youngest Grandchildren. Named Daisy a very pampered House Rabbit. 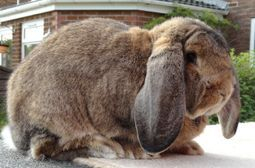 Deutz had a rough start to life his mum had no milk, so we fostered him & 2 more on to a Mini Lop Lucy she only had 1 kit herself she did a sterling job rearing them . By the time they where ready for weaning the French where not far of being has big has there foster mum. Dacia our Opal Doe is litter mate to Deutz, they have both made fine strapping adults. Duetz continues to father beautiful Babies. He loves to have a good run round. very inquisitive. Bred from Pixo & Southern Buck. Armstrong is litter brother to Sidley pictured above. 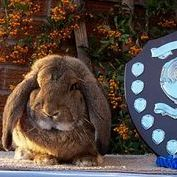 He made his debut at Harrogate 2014 he won the Agouti Class but had to give way to his other litter brother Endevour Rew who we sadly lost not to long after. 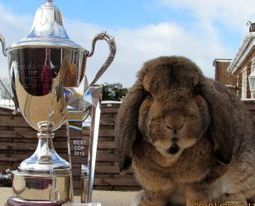 After a couple of weeks rest of we went to the all Lop Show at Coventry. 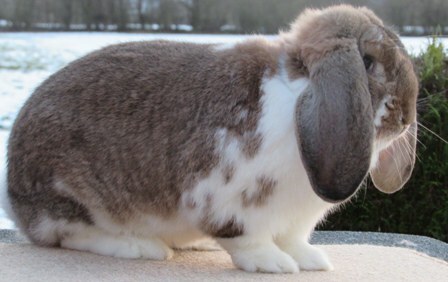 He was Best French Lop in Both the NFDLC & the Midland Lop. Every one that meets Armstrong falls in love with him he is a big soft Teddy Bear. He has also sired a litter to our Black Butterfly (Lottie) early days yet but they look very promising. Maverick is Drummer Boys son he has come out of retirement to help us to rescue Drummer Boys line. Sadly we almost lost this particular line, He was a very special Boy to Arnold & I so hopefully Maverick will help us get the line back on course this line goes back to the very handsome Import Buck Mistake. We now have Maverick babies very pleased, Agouti & Agouti Butterflies. Rossendales Lucian "Agouti Butterfly Buck"